Faith and I went back to Dr. Simmons for our results. Turns out that skeletally, I am a mess. I lean forwards and to the right. He said that he can’t even work on my nutrition until my alignment is fixed and no wonder my digestion isn’t functioning properly. Spinal alignment, the nervous system, and our organs all work together. If one is out of place, the others don’t work as well. I do know that my hips are off and have been for about 7 years (due to running on slanted streets). I have already been to three other chiropractors and two orthopedists about it. I have to trust that this man knows what he is doing. It is my only chance at having no lower back pain and getting it fixed, FINALLY. Some of the things that Dr. Simmons does baffles me and amazes me at the same time. He had me lie on the table and he tried the same resistance tests on my legs that he did before. Then he adjusted my hips and redid the test….I could hold my legs up. Then he asked me to think of something stressful, which wasn’t hard. I thought of putting the three kids to bed by myself. As I thought about it he pushed on my leg again – my leg fell like a rock! Can you believe that?!? Amazing. He said that I have to do something about my stress. Not sure what to do, but I will try to work on it. I consider myself a pretty low key person who eats well and exercises regularly. It was very humbling to know that my posture is a mess, my vitamins are less than, and I am affected negatively by too much stress. I am a stay at home mom, you would think that only business people get stressed. It also didn’t help that Faith came in with a cup of dry, sugar cereal. I guess just because a cereal is organic and gluten free doesn’t mean it is healthy. Dr. Simmons turned his nose up at it and laughed. As I left he said to me, “No one is perfect. There was only one perfect person and they killed him.” (Speaking of Jesus). I asked him if he was a Christian and he said “yes”. I could actually tell that he was before he even said anything. He also said that Faith’s stuffiness may be due to her first two spinal disks that are out of alignment. He said that she should be an easy fix and will only take four sessions. After her neck is adjusted, then if the problems continue, he will look at her nutrition. Amazingly, she slept through the night in her own bed for the first time in weeks and she could breathe easily all day long. Amazing! This entry was posted in Uncategorized on June 30, 2012 by Becca. 1. I have well behaved children…according to a mom at the playground. 2. Miller loves turkey vegetable dinner baby food. Ate an entire jar. I hope sleep through the night. 3. Faith is a fabulous big sister. She is my little babysitter when I need her. I went to put Wilson to bed and she entertained Miller for twenty minutes while he was in his high chair. I came back and he was laughing and had a toy balancing on his head. 4. What you teach your kids, they will remember. Wilson walked into the kitchen today and recited the Bible verse from VBS without any prompting. So proud! 5. When tired- chips, pretzels, cereal and an orange make a fine dinner. This entry was posted in Uncategorized on June 28, 2012 by Becca. Yesterday I went to an all day conference in Huntersville, NC hosted by the home school curriculum “Classical Conversations“. This is a curriculum that a few families from our church use. It is a Christian curriculum that is based on the “classical” model of education. Basically this means that they want kids to memorize a ton of information about history and science while they are young and they brains are still sponges. Then, after they have all the information in their heads, the next step is to move to the conceptual stage of learning. The third stage, Rhetoric, is the higher thought and philosophical stage of using the information. I truly believe that this way of learning can be very beneficial as the child grows and continues to reuse the information year after year. I wish that I remembered everything that I was taught, but I feel that I learned a little bit about a lot of topics over 12 years. This curriculum has a three year cycle so that every three years the kids are reusing the information stored in their brains. A great way to remember information. The hardest and most intimidating thing about Classical Conversations is that students are required to learn Latin and be fluent in it. I took my first look at Latin yesterday and it was difficult! You not only conjugate verbs (as in Spanish), but the nouns as well. It was very intimidating. I am not so sure I want to spend all that time and brain power on a dead language. There are benefits to it, such as word deciphering skills, but what else is there? I guess we will find out how hard it really is next year. Wish me luck! This entry was posted in Uncategorized on June 26, 2012 by Becca. It has been a pretty busy weekend. We have had three birthday parties honoring four kids: Cousin John turned 9, Sophie Drobnick turned 7, Gabriel turned 3, and Shepherd turned 1. I have had lots of pizza and cake this weekend….got my gluten fill, that is for sure! I am big on learning new skills these days. In the past, I would ask myself “What do I enjoy? What are my hobbies?” Unfortunately, I didn’t have any answers to those questions. Now I am trying to find some hobbies and some new things to enjoy in my limited free time. So far, I really enjoy my t-shirt remaking and I finally went to Zumba again the other day and remembered how much fun that is! Now I have knitting to add to my list of things that I can do. As a family, we try to spend quality time together on the weekends. Tom works out of town during the week so it is nice to all be together for a few days. The kids get especially excited. I took a video of them jumping on Tom last night after their game of Monster. They usually just leap over Tom and he catches them while he is lying on the floor. Last night the game turned into “jump on Daddy’s belly over and over again.” He definitely got his ab workout in. While they did that, Miller and I sat quietly in the other room. 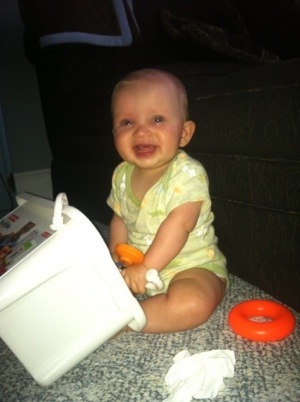 Miller is at that great age when he can sit up and play with a small bucket of toys – taking them out one by one, chewing on them, and then doing it all over again. It is a great time waster and entertainer. Overall, a successful weekend! This entry was posted in Uncategorized on June 23, 2012 by Becca. Faith and Wilson are going to VBS at Cross and Crown this week (which is where Faith went to school this past year). It has been fabulous! I have had three mornings to myself so far this week. Miller has been with me, but he naps every morning and is easy when he is awake. Monday I taught water aerobics and took a nap. 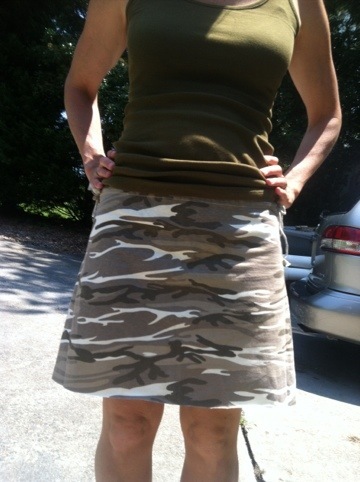 Tuesday morning I made a skirt and did Bible study. Today I did my Bible study, tried to make a skirt (but it didn’t go very well), and then I went to the mall to return something and stroll around. I have had a taste of extended “Becca time” and it has been fun. I love being a mom, but sometimes it is hard to do it all day. Tom keeps trying to encourage me to send the older two to school part-time next year, but I keep thinking about how much it costs and how they will only be little once. I want to be with them as much as I can. On the flip side, because I had free time in the morning I was able to have the energy to do a lot of fun things in the afternoon with them. On Monday, Faith and I went to see Dr.Simmons and then get ice cream. On Tuesday I took Faith, Wilson and Elliot (Faith’s BFF and neighbor) to the pool at the Y. 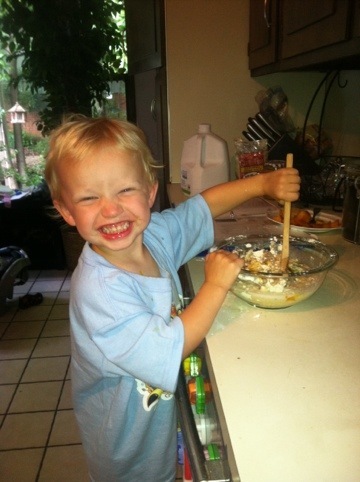 Today I played “Bob the Builder and Wendy” with Wilson and made muffins with Wilson. Then tonight I played Barbies with Faith in her room before she went to sleep. It has been a very productive and fun week. Who knows what will be done tomorrow!! 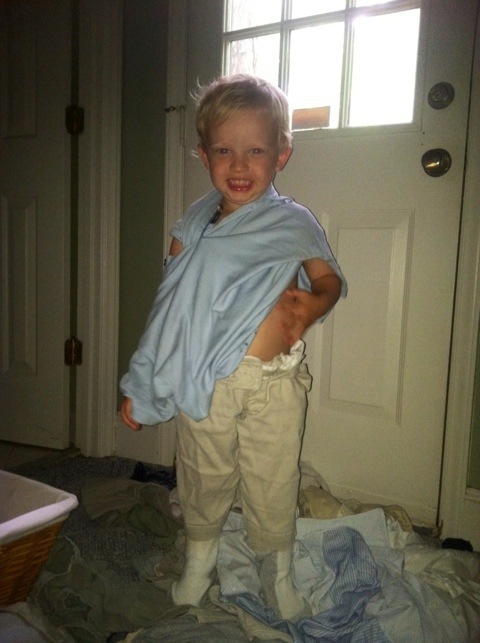 I called out, “Wilson, what are you doing?” He said, “I am being a Daddy.” I went into my room and he had emptied the entire laundry basket onto the floor and was putting on Tom’s shirt, shorts and had the socks on already. Too cute. This entry was posted in Uncategorized on June 21, 2012 by Becca. 1. Measure your hips and divide by 2. 5. Resew the outside seams together. Put two drawstrings through the front and back of the bottom seam of the shirt. After you put on the skirt you will tie the two strings together on the side of the skirt. 6. Voila!! A totally cute skirt that cost you only $3 and 30 minutes of your time! This entry was posted in Uncategorized on June 19, 2012 by Becca. Faith and I went to see Dr. Simmons at Chiropractic and Kinesiology Center. I went because I wanted to find a cause and solution to Faith’s constant stuffy nose and my digestive issues. I thought that there would be an answer today we have to go back for results and more tests in two weeks. Today was fascinating. He took a picture of my posture and then I laid on a table while he did some strength and reflex testing. I had try to keep my arm or leg from giving in to his trying to push it down. Seems like a simple test, but I failed miserably. I couldn’t keep my arm from collapsing. Amazingly, he put some digestion supplements in a plastic container, set it on my stomach, and then redid the strength test…I did better. He did the same thing again with some Stress “medicine” and I did better again. Hmmmmmm. I guess I will know more in two weeks.